Black band disease is a disease when corals develop a black band. It is characterized by complete tissue degradation due to a pathogenic microbial consortium  The mat is present between apparently healthy coral tissue and freshly exposed coral skeleton. 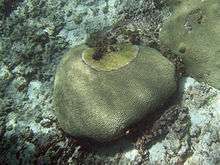 Black Band disease was first observed on reefs in Belize in 1973 by A. Antonius, who described the pathogen he found infecting corals as Oscillatoria membrancea, a cyanobacteria. The band color may be blackish brown to red depending on the vertical position of a cyanobacterial population associated with the band. The vertical position is based on a light intensity-dependent photic response of the cyanobacterial filaments, and the color (due to the cyanobacterial pigment phycoerythrin) is dependent on the thickness of the band. The band is approximately 1 millimeter (0.039 in) thick and ranges in width from 1 millimeter (0.039 in) to 7 centimeters (2.8 in) White specks may be present on surface, at times forming dense white patches. The pathogenic microbial mat moves across coral colonies at rates from 3 millimeters (0.12 in) to 1 centimeter (0.39 in) a day. Tissue death is caused by exposure to an hypoxic, sulfide-rich microenvironment associated with the base of the band. ↑ Hudson, JH (2000). "First aid for massive corals infected with black band disease, Phormidium corallyticum: An underwater aspirator and post-treatment sealant to curtail reinfection.". In: Hallock and French (eds). Diving for Science...2000. Proceedings of the American Academy of Underwater Sciences (20th annual Scientific Diving Symposium). Retrieved 2008-06-16. ↑ Antonius, A. (1973). 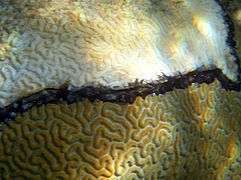 "New observations on coral destruction in reefs.". 10th Meeting Assoc. 1st. Mar. Lab. Carib. 10 (3 (abstract)). ↑ Richardson, L.L; R.G. Carlson (1993). "Behavioral and chemical aspects of Black Band disease of corals: An in situ field and laboratory study". In: Heine and Crane (eds). Diving for Science...1993. Proceedings of the 13th Annual Scientific Diving Symposium. American Academy of Underwater Sciences: 107–116. Retrieved 2013-09-20. 1 2 Richardson, L.L (1997). "Occurrence of the Black Band disease cyanobacterium on healthy corals of the Florida Keys". Bulletin Marine Sciences. 61 (2): 485–490. Retrieved 2013-09-20. 1 2 3 Cooney, R.P., O. Pantos, M. D. A. Le Tissier, M. R. Barer , A. G. O´Donnell, and J. C Bythell (2002) "Characterization of the bacterial consortium associated with black band disease in coral using molecular microbiological techniques". Environmental Microbiology, Vol 4 (7), pp 401, Jul 2002. ↑ Riitzler, K. and D.L. Santavy. (1983). "The Black Band disease of Atlantic reef corals. I. Description of the cyanophyte pathogen". P.S.Z.N.I. Mar. Ecol. 4 (4): 301–319. doi:10.1111/j.1439-0485.1983.tb00116.x. ↑ Carlton, R.G. and L.L. Richardson, 1995. "Oxygen and sulfide dynamics in a horizontally migrating cyanobacterial mat: Black band disease of corals". FEMS Microbiology Ecology, Vol18, pp. 155-162.